This lovely vintage teapot was sold to us by Chaaroui Mohamed. His shop is located in Bab Ftouh Foundouk, and while there he told us the shop was originally his fathers business. 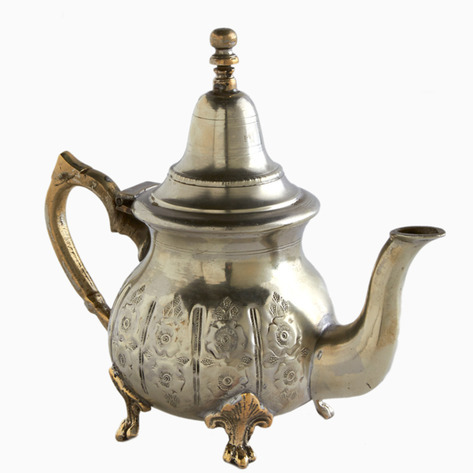 Now Chaaroui and his brothers and sisters see tea and coffee pots from all over Morocco ending up in their store. In Morocco, tea is served at all hours of the day. 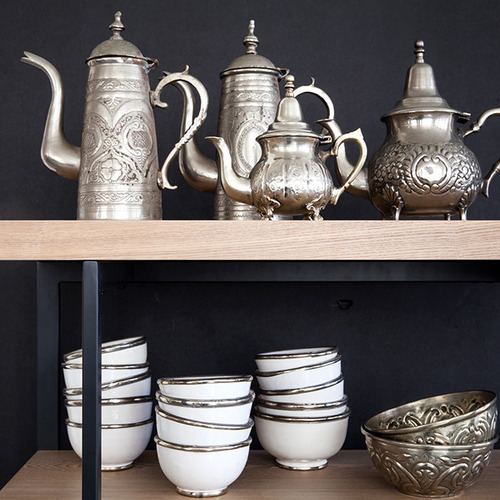 Whether the occasion is a visiting guest, a chat with a neighbor, or a business interaction; a tea service is one of the most powerful ceremonies in Moroccan culture. A drink of hospitality, it is believed that the gunpowder green tea leaves were introduced to the people of Maghreb in the 18th century, and continued to spread throughout the country as international trade flourished. The preparation of Maghreb mint tea is extremely important. While it varies from place to place, in Marrakech gunpowder green tea leaves, fresh mint sprigs and sugar cubes are first put into the teapot before it is filled with boiling water. The host then holds the pot high above the guest's glass and pours. The tea is then poured from teapot to tea glass a number of times until the ingredients are perfectly blended. Teapots are made in three sizes, and the tin, brass, aluminum or silver is hand-hammered by artisans—always with a long, curved spout to carefully pour the sweet tea into small glasses, from high above.